Beautiful little hostel in the hills of East Railey. East side is definitely not the nice beach side but it’s only a 10 minute walk to the other side. There’s ana amazing view from the pool. Staff were so nice, friendly and helpful. Clean rooms. I couldn’t even feel the person below me move even though I could hear him moving! Great AC. Decent food. Definitely stay here and book early - it fills up! nice walk up the stairs but on a really good part of the beach. Cool staff and always something to do. Really organized and great set up. would go there again. Nice pool just like you see in the Pic. Room key is like a watch so you wont lose it. Awesome place. Was a bit worried as the last Blanco hostel I stayed at was rather disappointing. Stunning views and a pool to cool down. Activities every day but it’s super easy to meet people without them. I wish I was in Railay longer, when I return I’ll be coming back here. Security lockers are a bit loose so that you can actually get your arm inside while it’s locked. But should be fine if you push your stuff far enough back. Friendly staff, lots of social stuff going on, clean room, great view from the pool & upper deck. Short walk from both the Krabi boat. Beaches, restaurants, tour operators are all close by. My friend and I had a great time staying at Blanco. They offer many activities and recommendations. Hardest part was climbing the 89 steps to reach the hostel. We met some fun people and enjoyed the cruise they advertise and the pub crawl. only stayed for one night. the stairs seem daunting but aren’t as bad as everyone else says. the pool is amazing and the view matches. there’s a lot to do in the evenings so you can either lounge around or do activities. because of the location everything was really expensive. in the room the ac didn’t work even when it was supposed to be on and the balcony was hard to lock so anyone can come in. 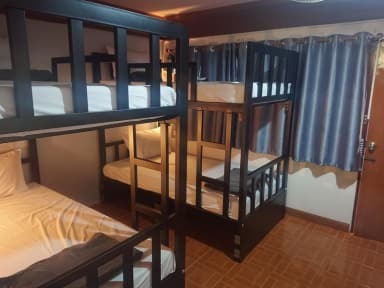 all in all good for a couple nights but wouldnt recommend for backpackers on a budget. Try and ask your long tail boat driver if they can drop you off at the east side, will save you some energy for the walk up the stairs (also miserable!). The aircon is off from 11am to 5pm which is rough if you get back from the beach and want to cool down. The toilet and shower are in the same room and are pretty dirty. Staff was nice but you could tell they were just backpackers who wanted to live here for free. Long and hot walk to Railay West. Won’t be back.